Welcome to my little spot in cyberspace. This is my very first entry so if you're reading this you probably saw me at the 13th Annual Gourd Art Festival and grabbed one of my new business cards. I hope I said "Hi" to you or we chatted and swapped gourd stories. If I wasn't there you probably saw my husband, kids, or my mom, who flew out from Colorado to witness the event, although we all know it was a good excuse to see the grand kids. 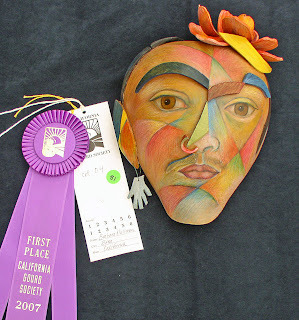 This was my first time exhibiting at the Festival although I have entered the California Gourd Society's Art Competition twice. Pictured are two entries that did well in 2007. 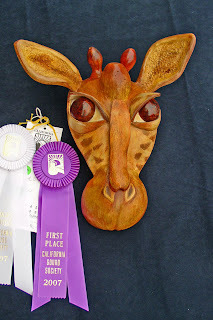 The mask below is called Frida Picasso, entered in the category of "Inspired by the Masters," and Giraffe, was placed in the "Mask" division. She's just as cool as I remember!